Talented actor of Bollywood Industry Varun Dhawan, who is known for his versatility, is now coming up with another intense flick “October”. Therefore, for the same Varun was witnessed in Delhi. As he launched the third soulful track from his film, Tab Bhi Tu, sung by none other than Rahat Fateh Ali Khan, composed by Anupam Roy and lyrics by Tanveer Ghazi. 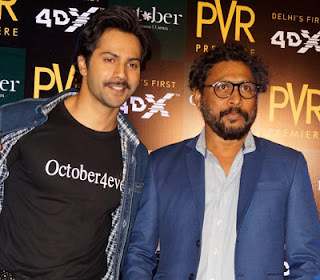 The launch took place in PVR at Pacific Mall, Subhash Nagar, where along with Varun the director of the film Shoojit Sircar was also present to grace the event. Apart from the song launch, the leads, the director & the actor interacted with media peeps. They revealed few details of the film. On asking about his experience and film October, Varun stated, “I am really blessed to be a part of October, when I did this film, it left an impact on me in a big way. I would say, you guys will understand the real meaning of love by watching this film. The real Varun who wanted to be an actor, the inside out what I wanted to do, I hope I got that from this film. I really needed such film in my life.” While thanking the director Shoojit, Varun further stated, “I really thankful to Shoojit Ji, for accepting me. Well, Varun will be portraying the character of Dan: A hotel management trainee and career-oriented person. Along with him the movie also stars Banita Sandhu and Gitanjali Rao in lead roles.